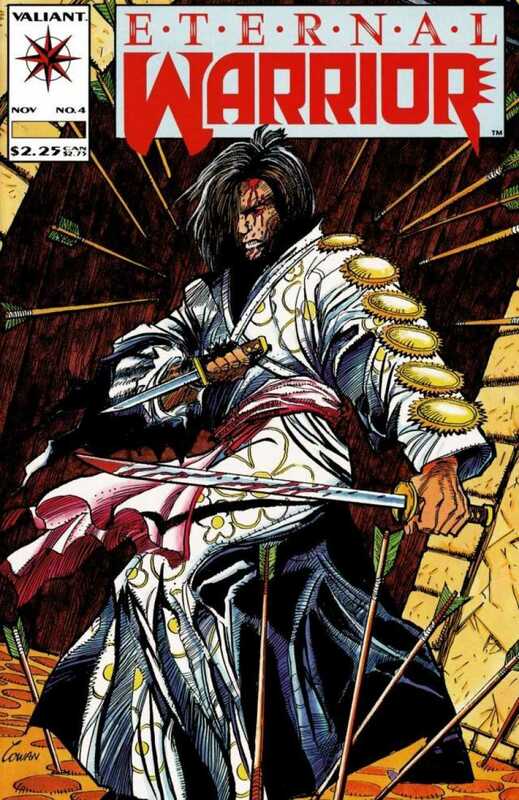 Eternal Warrior #4, Rai #0, Valiant, November 1992. I was at the Niagara Falls Comic Con (Canadian side) this past weekend and had the pleasure of talking comics with some very knowledgeable people. I always try to come out of a con with at least a couple of Undervalued Spotlight candidates, where better to gain some knowledge and get the pulse of the market?! Saturday after the con a few of us made a little Club Soda run, it was a quick walk from the hotel and we talked comics all the way there. We passed by a mall parking lot where a bunch of young guys gathered around their cars, you know the guys with their cars all shiny, with added spoilers and extra lights everywhere. There were probably doing the same thing we were doing, talking about stuff they loved. I said they reminded me of the Fast and Furious movies and that somehow segued the conversation over to Vin Diesel signing on to play Bloodshot in the upcoming Sony movie. Bloodshot is the 1st of Sony’s planned multi-movie project involving characters from the Valiant Comics universe. 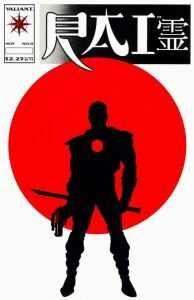 Someone mentioned that Valiant had actually been fully bought out (after some partial ownership) by the Chinese firm DMG fronted by an American named Dan Mintz. The whole conversation stuck with me and when I got home I did a little digging and speculating. 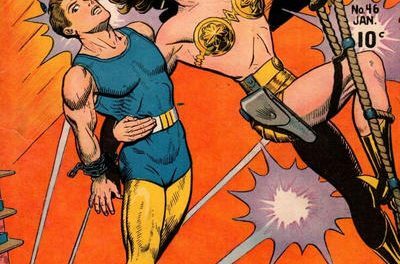 I speculated myself into choosing Eternal Warrior #4 and Rai #0 as this week’s Undervalued Spotlight picks. Eternal Warrior #4 features the 1st partial appearance (last page) of Bloodshot while Rai #0 represents the 1st full appearance and partial origin of Bloodshot. Bloodshot is a super soldier along the lines of a RoboCop/Jason Bourne/Total Recall, his bloodstream contains a billion nanocomputers giving him a wide range of cool abilities. Here’s what I’m excited about, as of right now the superhero cinematic universe is ruled by Disney/Marvel and Warner Brothers/DC. 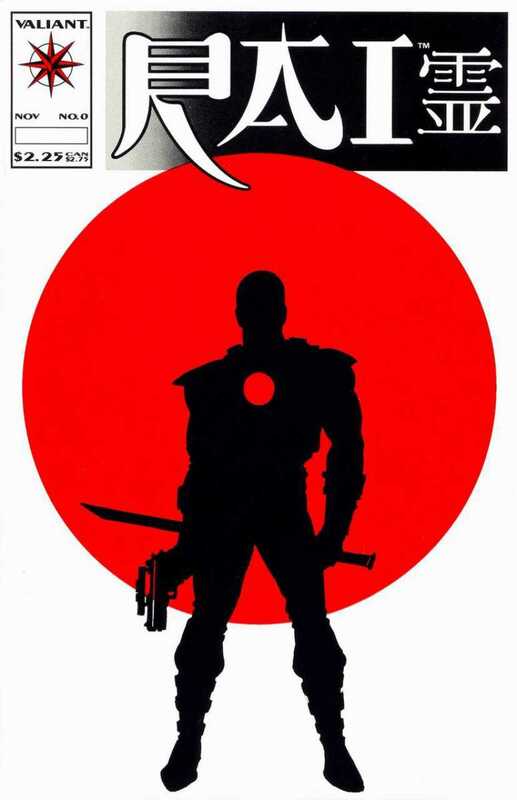 Valiant represents a potential 3rd comic book driven cinematic universe with characters taken from the much acclaimed Valiant project of the 1990s. Valiant boasts a popular stable of characters including Harbinger, Archer and Armstrong and Bloodshot. Have you noticed how much weight is given to the overseas box office numbers with every superhero movie release these days? Overseas numbers now out box office domestic box office! Like in all international business dealings there are regulations to follow and hoops to jump through for equitable and profitable distribution deals overseas especially in the world’s second-biggest movie market – China. Part of the excitement of the whole Valiant movie project is that it will not be American driven. This whole enterprise will be Chinese driven with obvious international partners like Sony Pictures. I think what I’m trying to get at is that these Valiant properties will have a much more International approach to character development and to the storytelling and movie making. I think this may lead to more “ownership” of the characters by the International market. Will these characters be viewed as less of an “American cultural export” with an international fan base and more as characters the international markets call their own? 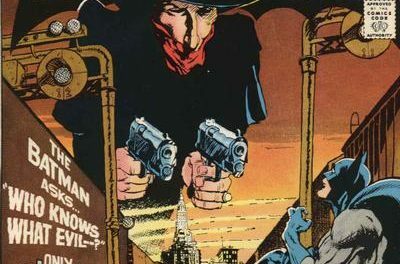 Whenever lots of new fans are created there is always a percentage that seeks out the source material which in this case happens to be Valiant Comics from the 1990s which would lead to stronger demand and thus stronger market prices. I know there is a lot of speculation here but then again speculation is a cornerstone of our hobby. 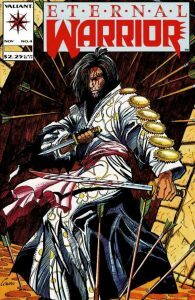 Right now CGC 9.8 Eternal Warrior #4s are getting just over $210 while Rai #0s are getting about $140. There are 874 CGC 9.8 Eternal Warrior #4s with no grades above while Rai #4 has 999 CGC 9.8s, 5 CGC 9.9s and 1 CGC 10.0. The 47th Overstreet price break for this book is $14/$20/$25 of Eternal Warrior #4 and $13/$18/$22 for Rai #0 in the 8.0/9.0/9.2 grade splits. There are two versions of Rai #0, a “glossy” and a “matte”, the glossy being rarer (offers generally say only 7500 of these were printed). GPA does not distinguish these so you have to look into the CGC S/N to figure out which is which. It looks like the glossies go for around $250-$300 while the matte are pretty consistent at $95 recently. Without circulation figures for the matte it’s hard to say anything about these prices, as there seem to be many more matte sales than glossy sales, it stands to reason that the glossy is significantly rarer. (It seems kind of weird to me that CGC distinguishes the versions on the case labels, but lumps them together in the census.) As it costs about 2.5x the matte, it seems like the glossy is the way to go if you are going to buy this pick. 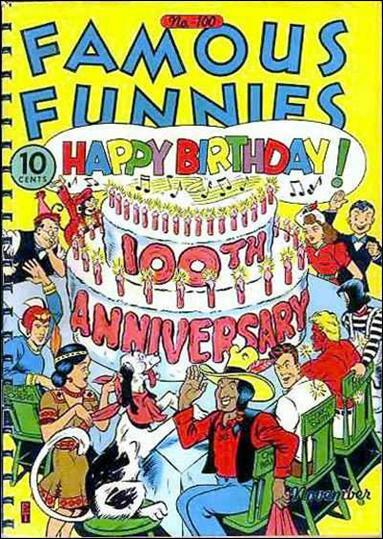 I don’t know anything about this book, storyline, movie, etc., so I have very little to say. I don’t like the large number of pristine copies available, but I was shot down (I guess rightly) because I brought that up last time. (I already sold my original owner copy of ASM #300 based on this feeling and it wasn’t a good call.) I guess if this really takes off it is likely that this being a Valiant title, demand will still outstrip supply. I guess my main counterargument would be Sony’s movie track record. Certainly this has been the topic of discussion on Comic Culture a number of times. The Chinese involvement is a wild card, and I am not too inclined to bet on wild cards. I wish the movie the best as more successful comic-based movies are good for the hobby, but I’ll stay on the sidelines for this pick for now. Good decision Chris. The run up on these books already happened a few years ago and don’t get me started on the Chinese market. It remains to be seen if this movie will actually happen as the production schedule keeps getting kicked down the road. Much like Universals Dark Universe and Hasboro’s Toy Universe… it’s all just “pie-in-the-sky” till it actually happens. But more importantly, without the promise of a potential movie… what interest is there for these books? Thanks for flushing out the matte/glossy issue. CGC is causing similar issues with not separating UPC vs Spidey Head on books like ASM #300, there are issues with the CDN price variants of the 80s as well. I know the speculation got to these books a couple of years ago but I’m arguing that the demand a successful roll out of the films would bring should easily push the prices past the current “speculation with trepidation” prices.